Contest Offers $500 and Other Cash Prizes, Celebrates Artists’ Control of Their Own Music. There’s an infinite selection of music...being there is not the problem, it’s how to connect with the people who might really love my music. This partnership with DMU, Intercept and Treever is a glimpse of a future where musicians control their own path to success. 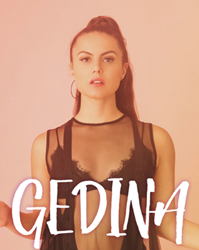 The future of digital music distribution, promotion and marketing comes into clearer focus today as singer-songwriter Gedina partners with a trio of technology companies focused on distributing music to the broadest possible audience. Lean Back Lover by Gedina – The Contest, running through March 31, 2018, is a fun and friendly competition to see which fan will share Gedina’s newest and freshest song Lean Back Lover to the most people, with a Grand Prize of $500 plus other cash prizes. The contest is sponsored by Digital Music Universe (DMU), which distributes Gedina’s music; and Intercept Music by LiveChime, a suite of software tools that allows musicians to directly and professionally market their music to their most likely audiences. The app maker Treever powers the contest: fans will set Lean Back Lover as the soundtrack to a short clip that is automatically generated by the app (a “Treeve”). The individual who sends their Treeves to the greatest number of their friends by the contest deadline will win the top prize, with a second prize of $250 and five third prizes of $100 each also on offer. DMU, Intercept Music and Treever were each founded separately, but have found tremendous alignment in their mission. The companies have a common goal: to share the power and emotion of music with as many people as possible. Created by industry veterans with decades of experience, DMU offers a full range of distribution, marketing and promotional services directly to music producers and artists on a cost-effective, monthly subscription model. Intercept Music by LiveChime is an artist-focused suite of do-it-yourself social media marketing tools. With a sophisticated posting engine, reporting dashboard, and fan-building tools for major platforms including Facebook and Twitter, artists can automate virtually all of their social media exchanges. The powerful set of software tools, available as a monthly subscription, empowers musicians to build their fan bases in less time, while having more freedom to create their art. Treever is a mobile application designed to combine photos or video with a wide range of music put to a dynamic animation template. The resulting short clip, or Treeve, can be enjoyed and shared either as a fully automated and spontaneous creation, where the app generates music, photos and animation, or a manually created Treeve with photos and music selected by the user. The app is available in iTunes and Google Play stores. The mission of Digital Music Universe (DMU) is to set the new standard for global digital media distribution and marketing. DMU offers a suite of services (distribution, marketing, and promotion), in a one-stop shop for music creators (producers and musicians). This allows Artists to self-promote in an extensive public-facing platform with competitive pricing models for the Artist or label.